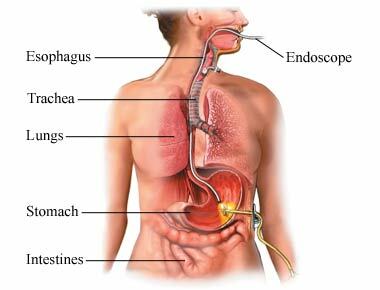 Percutaneous endoscopic gastrostomy (PEG) is a procedure to place a tube through the belly wall. The tube will connect to the stomach. The doctor will review the results of previous tests. You may need to have a physical exam. Don't eat or drink for at least 8 hours before the procedure. Talk to your doctor about the medicines you take. You may be asked to stop taking some medicines up to 1 week in advance. Local anesthesia will be used. Throat and skin above the belly will be numbed. It will not make you sleep. You will be given a sedative to help you relax. The doctor will pass a scope through your mouth and into your stomach. The scope has a camera that will send images to a screen in the room. This will help the doctor find the right place for the PEG tube. Other tools can also be passed down the tube. A needle will be placed through the belly wall and into the stomach. A thin, long wire will be passed through the needle, and into the stomach. A snare from the tube will grasp the wire and pull it out through the mouth. The PEG tube will then be passed over the end of the wire. The wire will be pulled back down into the stomach. It will pull the PEG tube into the stomach and out through the belly wall. A small incision may be made in the skin to allow tube to pass through skin. A bumper inside the stomach will stop the PEG tube out from leaving the stomach. The wire will be removed. A second bumper will be placed around the PEG tube outside the belly wall. This will keep the tube from sliding in. A bandage will be placed over the area. The PEG tube will be taped to the belly. Anesthesia will prevent pain during surgery. You will feel sore for a few days after the placement. Medicines will ease pain during recovery. You may need an overnight stay. If you have problems, you may need to stay longer. Wash your hands often. Remind visitors to do the same. Do not allow others to touch your tube. Take care of the PEG tube. This includes changing the dressing and cleaning the around the site. You will also need to watch for signs of infection. Follow nutrition plan given by your care team. Avitsland TL, Kristensen C, Emblem R, et al. Percutaneous endoscopic gastrostomy in children: A safe technique with major symptom relief and high parental satisfaction. J Pediatr Gastroenterol Nutr. 2006;43(5):624-628. Ljungdahl M, Sundbom M. Complication rate lower after percutaneous endoscopic gastrostomy than after surgical gastrostomy: a prospective, randomized trial. Surg Endos. 2006;20(8):1248-1251. Percutaneous endoscopic gastrostomy (PEG). American College of Gastroenterology website. Available at: http://patients.gi.org/topics/percutaneous-endoscopic-gastrostomy-peg. Accessed August 24, 2018. Understanding percutaneous endoscopic gastrostomy (PEG). American Society for Gastrointestinal Endoscopy website. Available at: https://www.asge.org/home/for-patients/patient-information/understanding-peg. Accessed August 24, 2018.